Solomon Warriors were favourites to win the second league as they did the first especially as Marist Fire offered little by way of opposition against them. With already 3 losses to Solomon Warriors this season Marist Fire would need a miracle comeback. The opening quarter of the game was not favourable to either side as the infamous Lawson Tama heat bore down on the players. The first shot on goal took 13 minutes to arrive but when it came it was not much to speak about either. Alick Maemae picked up a return ball outside the 18 yard box and gave it his best but it went wide. Another opportunity was offered to Maemae just minutes later but he could not catch up with Willie Daudau’s pass. Tigi Toata looked more promising in the 19 minute but he sent his shot straight to the keeper after Daudau found him free on the right. Solomon Warriors, however, took the lead after 25 minutes of play when a lovely pass from Maemae found the lurking Carrol Kakate with the Marist Fire defenders chasing. He did not waste further time in going for goal with a left-footed strike which saw the ball past the keeper and into the back of the net. Marist Fire’s best hope for a goal in the first half was of the boot of captain, Joachim Waroi, who took the free kick duties when Abraham Iniga was fouled by Hadisi Aengari just outside the box. He was on target and a lesser goalkeeper would have let the ball through but it was Paul Huia on the line for Solomon Warriors and he made a safe save. With just a slender lead at the halftime break there was still a lot to play for in the second half. But Solomon Warriors made sure that everything would be going their way with a goal in the 47th minute to Kakate taking the lead to 5 nil on aggregate and 2 nil for the match. Solomon Warriors threatened to go further through Jamie Molea but the youngster missed twice right in front of goal on 2 different occasions. Kakate almost completed a hat trick minutes later but found the pass too fast for him. Kakate made sure his hat trick was completed late in the march with a shot taken from distance. It was a stunning performance from the striker who has done well for his club after returning from Papua New Guinea. 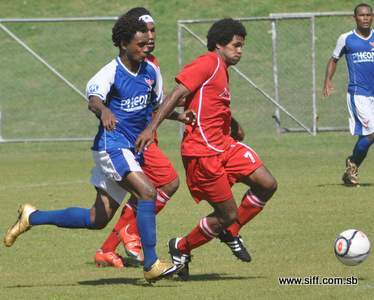 Solomon Warriors’ semi final opponents will be Western United who overcame Malaita Kingz 2 – 2 with the away goal advantage going their way. Their match is scheduled for 3:00pm on Thursday.